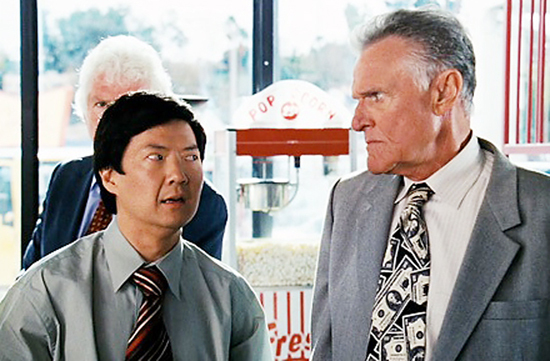 Ken Jeong, left, in a scene from The Goods. Recent protests over the Pearl Harbor scene in The Goods (in which Ken Jeong’s character gets attacked by fellow car salesmen for looking Japanese) succeeded in getting the offensive bit removed from trailers. But did it really change the attitudes that screenwriters or directors have about race or stereotyping? Did it show that Asian Americans have influence over how Hollywood portrays us? Not really, says blogger Phillip atÂ YouOffendMeYouOffendMyFamily. He writes that the protests over The Goods and other movies with offensive scenes won’t do any good because Asian Americans don’t matter at the box office. Marketers have always had a hard time defining and selling to Asian Americans, a group thatÂ doesn’t really exist, according to Oliver Wang atÂ Chasing Chan. The term Asian American encompasses many ethnicities, nationalities, languages and histories. There’s no common thread that ties group members together. It’s a political term that grew out of the Yellow Power movement of the 1970s. I worked for a company during the mid-1990s Internet boom called ChannelA.com that had its roots as something like Hyphen but morphed into a web site about Asian culture that targeted non-Asians because it was a bigger market. I kind of felt like we were abandoning our community and made it seem like Asian Americans weren’t worth the effort. It was disheartening, but it was a pragmatic move. A lot of magazines have come and gone trying to cover the Asian American market. Hyphen is getting by with a volunteer staff and a nonprofit model, but we face many of the same obstacles as our predecessors. One of the reasons Hyphen exists is the belief that mainstream media doesn’t cover Asian Americans, however you define it, adequately or accurately. Media outlets such as Hyphen can also provide a counter balance to things like the Pearl Harbor scene in The Goods. African Americans have protested Hollywood, too, but movies aimed at black audiences also sell a lot of tickets, so that’s when the studios perk up and listen.Â Phillip breaks down the numbers in hisÂ post. In that same vein, it’s great that Hyphen and publications likeÂ Giant Robot,Â Theme,Â East West and KoreAm Journal are still around, but like the movies, there may not be enough box office, at least for ad agencies. Do you subscribe to Hyphen or one of the other magazines? Did you pay to see Better Luck Tomorrow? If no, why? Or, if you do subscribe and pay for movies, I’d love to hear why, too. I’m just wondering if there’s something that can create a critical mass audience. Maybe Oliver is right, and there isn’t. But I still think it’s worth the effort.